What Type of Account Manager Are You? What type of account manager are you? Is it something you’ve thought about? Account management coverage is a bit like a pyramid. Very large and important customer accounts are few and far between. Each account might have a number of people, a whole team in fact – looking after it, each of whom may take a specialist role. 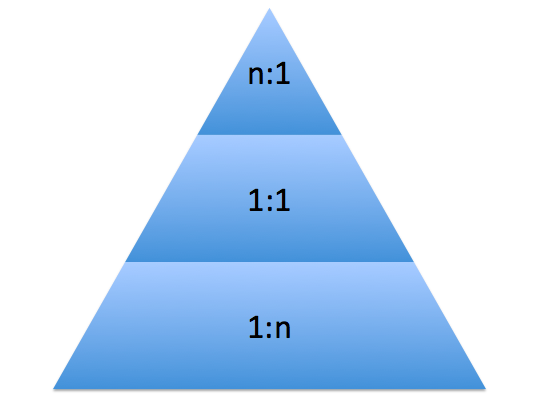 This is the n:1 approach, where the left side of the colon is the vendor or supplier, and the right side is the customer or buyer. When I worked in sales effectiveness and sales training, I heard of one lady who was responsible for a team managing an account in the US pharma industry worth $10bn per year. That account was twice the size of the US sales effectiveness and sales training industry. Some businesses work with large accounts, but they’re of a size where one dedicated account manager can serve that account himself or herself, full time. This is the 1:1 relationship. Then there’s the other accounts which make up the vast majority of business. These accounts are sufficiently small that 1 person can manage them as a portfolio of multiple accounts. Sometimes this means 5 accounts, and sometimes it can be as high as 500. It depends on how strategic or tactical the accounts are, and how proactive or reactive your approach is. This, as you might have guessed, is 1:n account management and it probably accounts for most of the account management roles that people fulfil. It’s important to think abut account management coverage this way because it helps identify the priorities that govern your company’s business, your time and your focus. In a previous post on account management, I talked about the joy of discovering white space, that happy place where there might be an opportunity for you to sell something else to your existing customer. I say ‘might’, because you don’t yet know if there is an opportunity. There’s something else you need to do. In order for there to be an opportunity, you need to figure out if there is there something of value that you can deliver to your customer, something that your customer needs. Researching your customer is probably the most valuable use of your time. The better you know them, the more you can help them. When you profile your customer, analyse their performance, figure out what they’re trying to do with the business, where their problems are, then you can start to figure our what they need to do to fix those problems. If there is something you can provide to help them fix those problems, you have created an opportunity to do business with them. The best thing about this is that, right now, this opportunity is not a competitive one. It only exists when you proactively propose it to your customer. You created it :-). This is not about Star Trek and the most famous split infinitive in screen history. This is about finding additional value and revenues in the most important area of your business, namely your existing accounts. When you manage opportunities, you can only win a certain percentage of the sales opportunities that exist, that you have either heard about or that your customers or prospects invited you to tender for. To get control back in your sales performance you need to do something quite obvious, quite simple, but to many people – quite radical. You have to create opportunities. But from where? From the realm known as account management. One of the most powerful things you can do is draw a simple matrix. Across the top axis is the list of things you sell, all your specific products or services groupings. Down the side you put the list of your all existing customers. Then you take your customer records and plot which customers take which of your offerings, colouring in the box at the intersection of the particular customer and the particular product or service. Maybe you can colour the intersections differently to distinguish between different groups of customers or groups of products or services. The most common colour in your matrix is likely to be the one you miss, the one you can’t see. Yes, it’s the white space. The white space is the area beloved of graphic designers because it lets the important content breathe on the page or screen. In account management the white space is beloved of sales and marketing people because it is the land of opportunity, the place where you haven’t yet sold something into your customer. At this stage, of course, you haven’t created any opportunities. You’ve simply identified where they might exist.